Dance camps are fun and teach your child valuable skills. A summer camp is the perfect way to try something new or enhance existing skills. What a great way to keep their bodies active and make new friends. 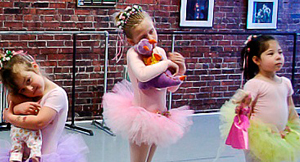 Ballet Buffalo offers Storybook Dance Camps at both locations, the Ballet Intensive classes are currently offered at our Williamsville location. is a great way for students to hone their skills and get back into shape before returning to classes in the fall. With an emphasis on Classical Ballet, students also explore a wide range of dance disciplines and experiences with guest teachers as well as Ballet Buffalo faculty. Incorporates children’s literature, music, art and dance, encouraging children to explore their imaginations, act out stories through creative movement. Stretching, singing, and dancing are all part of the daily class! *Call to reserve a spot now as classes fill quickly. Click to learn more about Storybook Summer Dance Camp. July 9-13 and July 23-27 M-F 9:30-11:30 a.m.
August 6-10 and 13-17 1-4 p.m.
June 25-29 and July 16-20 M-F 9:30-11:30 a.m.
June 9-13 and 23-27 9:30-12 p.m.